The climate on early Mars has presented an enigma for planetary scientists because surface features such as valley networks indicate abundant liquid water was present and the clay minerals found in most ancient surface rocks need even warmer temperatures to form, while atmospheric models generally support a cold climate on early Mars. This new study led by Janice Bishop of the SETI Institute and NASA's Ames Research Center in Silicon Valley has addressed this question by investigating the conditions needed for the formation of the ancient surface clays. Part of this early Martian climate puzzle comes down to how "warm" is warm. Currently Mars' temperature is below freezing, but we know it must once have been warm enough for liquid water to carve out features on the surface. However, cold water is not warm enough for surface clays to form. 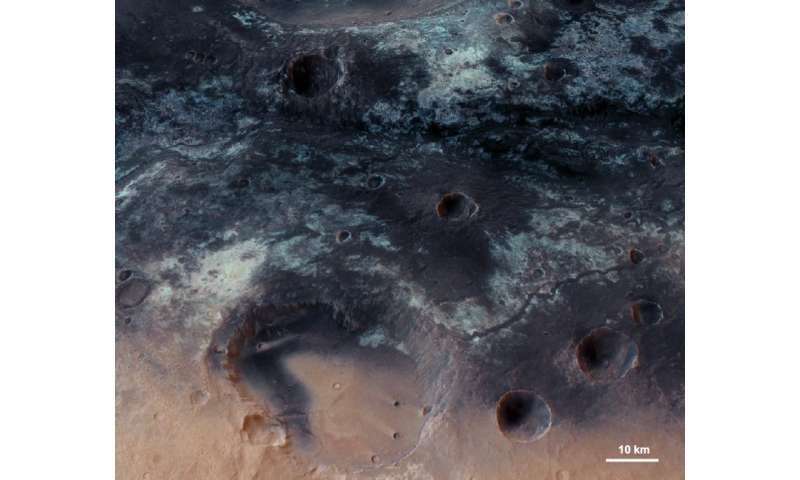 "We realized that in order to better constrain the early Martian climate, we needed to understand the formation conditions of Martian clays," said Bishop. This study evaluated the types of clays present in ancient, altered rocks on Mars and separated these into 3 categories: 1) Mg-rich clays formed at high temperatures (100-400 °C) below surface (e.g. mixtures of saponite, serpentine, chlorite, talc, and carbonate), 2) clays formed at warm temperatures (20-50 °C) in lakes, streams or rainy environments (dioctahedral Fe-rich or Al-rich smectites), and 3) poorly crystalline aluminosilicates such as allophane formed at cold temperatures (<20 °C). The authors used results from weathering in the field, clay synthesis experiments in the lab, and geochemical modeling of clay formation. 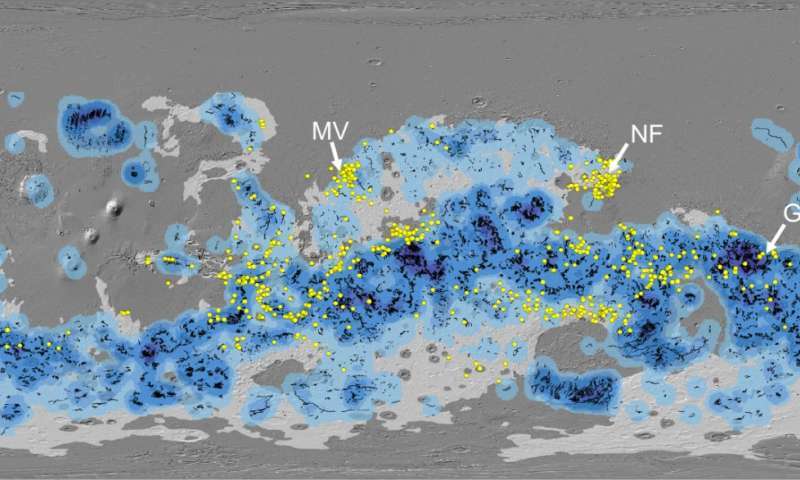 The authors postulate that short-term warm and wet environments, occurring sporadically in a generally cold early Mars, enabled the formation of the observed surface smectite occurrences on Mars. 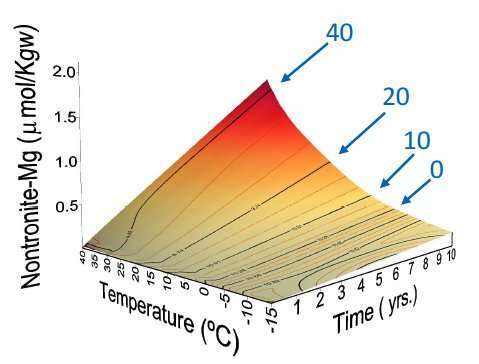 Further, there is a trade-off between temperature and time. Cooler temperatures (15-20 °C seasonal, diurnal Tmax) would require sustained periods of high water/rock ratio on Mars to produce the observed smectite outcrops. This could mean hundreds of millions of years at 5 °C global mean average temperature on Mars, which is unlikely given the current models of the atmosphere. Surface smectite (nontronite, montmorillonite) beds may have formed quickly during short-term periods of warm temperatures (25-40 °C seasonal, diurnal Tmax ). This could mean tens of thousands or millions of years at a global mean average temperature of 10-15 °C on Mars at intervals over hundreds of millions of years. These elevated temperatures could have been caused by volcanism, obliquity changes, or large impacts. 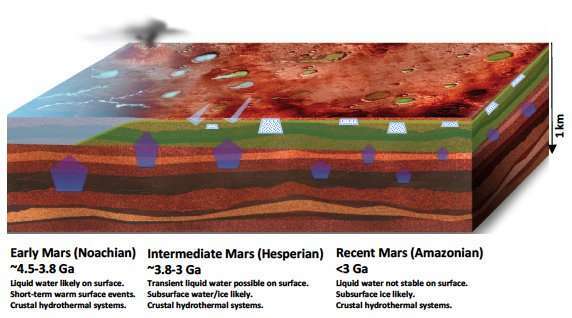 Understanding the climate on early Mars provides constraints for when liquid water was present on the surface and is essential for determining where on Mars to search for life. Clays are the most abundant hydrated mineral on Mars; thus, defining their formation conditions is a big step towards understanding the geochemical environment on Mars.